The Asgard Anime Vault celebrates old school anime that certainly made every 90′s otaku proud have lived those years as well as introduce young otakus to these great titles. This week, Asgard takes a disc stone and unleashes the power of Monster Rancher. Monster Rancher, or Monster Farm (モンスターファーム) in Japan, is a video game franchise that was first released in November 30, 1997. Often compared to giant, rival monster games namely Pokemon (ポケットモンスター) and Digimon (デジタルモンスター), Monster Rancher humbly stands out as a game with the objective that players are monster breeders; they raise their creatures in perfect health in order for them to be the best in tournaments. In April 1999, an anime adaptation of the video game was released with a total of 73 episodes and is separated in two seasons, namely Monster Farm Enbanseki no Himitsu (モンスターファーム~円盤石の秘密~) and Monster Farm Densetsu e no Michi (モンスターファーム~伝説への道~). Genki is a young boy who loves to play video games, specifically Monster Battle. After receiving a copy of the Monster 200x game from the mail, Genki played it on his console. The game, however, transported Genki into another world. Genki met a girl named Holly in a temple where he last left the game. 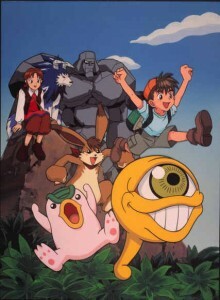 Together with Mochi, Suezo and the other monsters, Genki and Holly must search through the world of Monster Rancher to find the Phoenix, the only monster who can defeat the evil Moo. Monster Rancher is the perfect anime for young children or the children-at-heart. This anime relives those moments where you yourself wish could be transported into another world to meet and train monsters.